Red and white coloring, the lemniscate (infinity symbol), a small wand, a table displaying a chalice, a pentacle, a staff (wand) and a sword. Travelling on his way, the Fool first encounters a Magician. Skillful, self-confident, a powerful magus with the infinite as a halo floating above his head, the Magician mesmerizes the Fool. When asked, the Fool gives over his bundled pack and stick to the Magician. Raising his wand to heaven, pointing his finger to Earth, the Magician calls on all powers. Magically, the cloth of the pack unfolds upon the table, revealing its contents. And to the Fool’s eyes it is as if the Magician has created the future with a word. All the possibilities are laid out, all the directions he can take: The cool, airy Sword of intellect and communication, the fiery Wand of passions and ambition, the overflowing Chalice of love and emotions, the solid Pentacle of work, possessions and body. At #1, the Magician is the male power of creation by willpower and desire. The lemniscate (infinity symbol) over his head indicates the energy of thought. Thus, he draws divine power down from the heavens into his white wand, molds it with that energy of thought, and makes it manifest on Earth (his finger pointing to the ground). This is that most ancient magic to make real whatever he imagines in his head merely by saying it aloud. (“And God said ‘Let there be Light!’ and there was Light”). Reflecting this is the fact that the Magician is often represented by Mercury. Mercury is the planet and god of smooth talkers and salesmen. Also clever with the sleight of hand (Mercury *was* the god of thieves!) and a medicine man – either a real doctor or someone trying to sell you snake oil. The 4 suits before him remind us of the 4 aces, which in the Tarot symbolize the raw, undeveloped, undirected power of each suit. When the Magician appears, he reveals these to you. The tarot reader might well interpret this card as telling the querent that they will be given a vision, an idea, a magical, mental image of whatever it is they most want: the solution to a problem, an ambitious career, a love life, a job. If any card in the Tarot is the Tarot, it is the Magician. He’s one of the most recognizable cards, always a favorite. He’s also the only card in the major arcana that refers to the minors with the “trumps” displayed upon his table. One way to look at them is as ideas that the Magician is offering you. Thus, the card is about getting an idea and finding a way to verbalize it. This is the first step toward making it a reality. Which is why the Magician can indicate a time when one is eloquent and charismatic, clever, witty, inventive and persuasive. Keep in mind, however, that the Magician could be a trickster. If this card represents some magnetic person in the querent’s life, they need to make sure that he’s or she is a genuine magician, not a con man. The card can also indicate an interest in certain careers or someone who is already in one of those careers: a scientist, inventor or medical professional. The card also relates to careers where speech and writing is of great importance: a salesman, motivational speaker, storyteller, politician, or commentator. This might be the querent himself, something the querent wants to be, or someone who was, is or will be in his life. Most importantly, the Magician card stands for the “reveal” – as in a magic trick. The handkerchief is draped over an empty box, the Magician waves his wand, *presto! *–now there is a dove in the box. The Magician card does the same for the querent–only what it reveals is not birds or rabbits but NEW idea: emphasis on NEW. Today is a magical day! 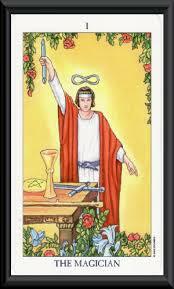 The Magician is a card of self-realization, power, and thoughts manifest into reality. The Magician represents your inner power, the magic within you, reminding you that you are the creator of your life. When the Magician calls, you are in the process of this creation, you remember who you are, and what you can do. You can do anything you want, your intention is all it takes, and today you know this, today you are living in the moment and it is delicious! The Magician speaks to you today, reminding you that you are a part of it all. You are an infinite being, experiencing life in this human form. You are remembering that you have this power, and life is falling into a sweet place, in fact it is the sweetest place you know right now. There is no fear, no doubt, in this moment you feel the love of the entire universe and you know you are on path. The path you are on is magical; you feel the synchronicity in every step you take. You are in the flow, and it feels good! You are giving all of your attention to the present moment. This moment has become sacred, and your intention has shifted to keeping it sacred. Everything you are doing right now, you do whole heartedly, with everything you are. It is through this mindfulness that you are transforming, that you are shifting your life, molding it into the exact experience you want! Feel the vibration?! With The Magician comes ideas, thoughts, and solutions. You will see doors open that you did not even realize were there. The possibilities are unlimited….you are pure potentiality! Be mindful of what you are creating and the process unfolds before your eyes….stay present! If your question today involves love, then the magician tells you that someone new is coming into your life, the love that you have been seeking is here! Open your heart and receive it! If you are in a relationship, you will find that your connection with deepen, go to a new place, it will be delicious! If your question involves money or your career… relax, doors are opening in such a way that you will find deep fulfillment and financial sustainability! Listen to your inner voice, new ideas are coming through you guiding you on the way to go! Remember to follow your heart, and feed what excites you! Spiritually speaking the Magician tells you that veils are lifting unlike ever before in this life, and you are connected to a deeper sense of oneness. Stay in communication with your angels they will help you through this process. Again, relax, go with it, and trust that it is taking you to a higher place. You are opening a new chapter, you are expanding not only yourself but you are helping others as well! You wield the power to create what you want! Today’s Meditation is a moving meditation….every person you come in contact with today has something for you and you have something for them. Be mindful of this, offer to everyone you meet a gift, be it a compliment, a flower, words of encouragement, anything that feels right to you, trust your inner guidance. In addition, be aware, be open to receiving something from each person you come in contact with. Step into the flow and see where it takes you! Enjoy your day!!! I absolutely love this card….we always get what we need exactly when we need it! I know I did today!!! Did you?? I would love to hear what you think, your experiences, your questions, and comments!! Please share or connect anytime. I am sending much love, light, and magic your way!!! Can you feel it? ?